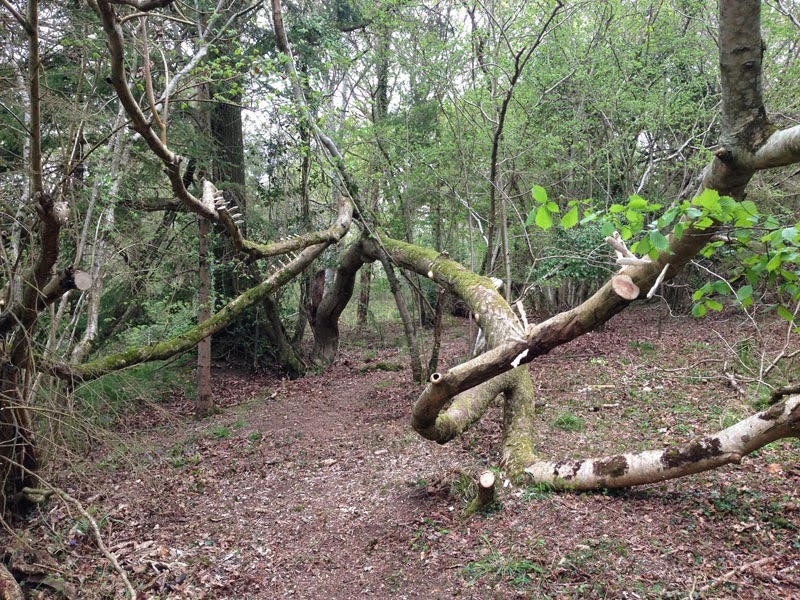 Young Wood on the Blackdown Hills. 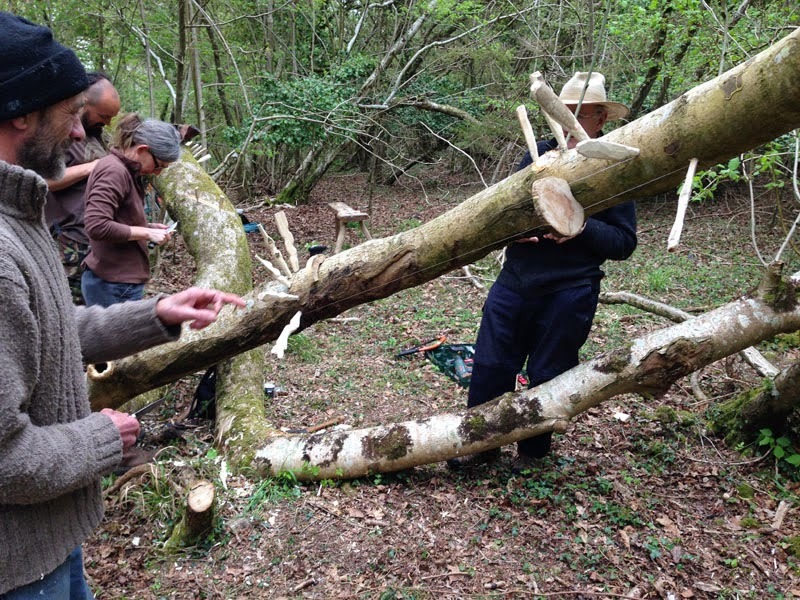 A community Woodland, a wonderful wood, a place of bush craft and workshops managed by Gavin Saunders and Jenny Archard. 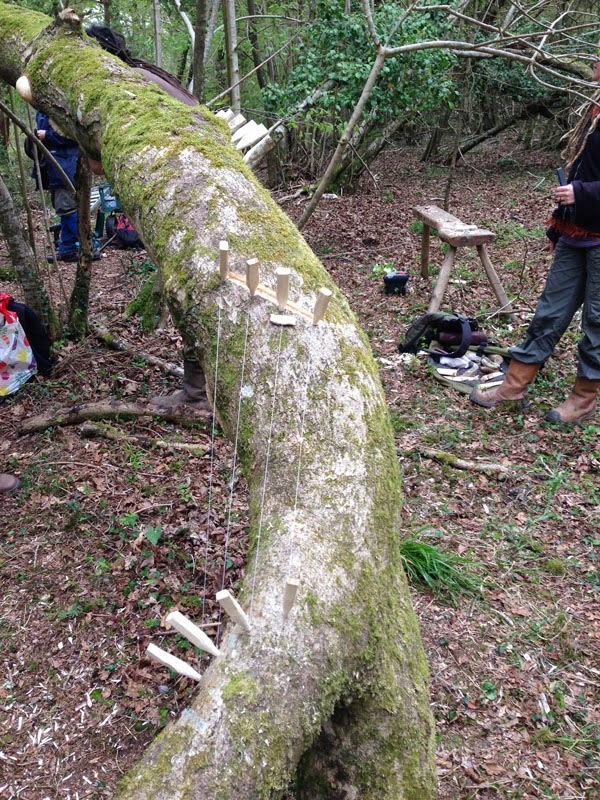 I was invited to hold a tree harp workshop in the wood for the volunteers. We gathered on saturday weather good and all in good spirits. 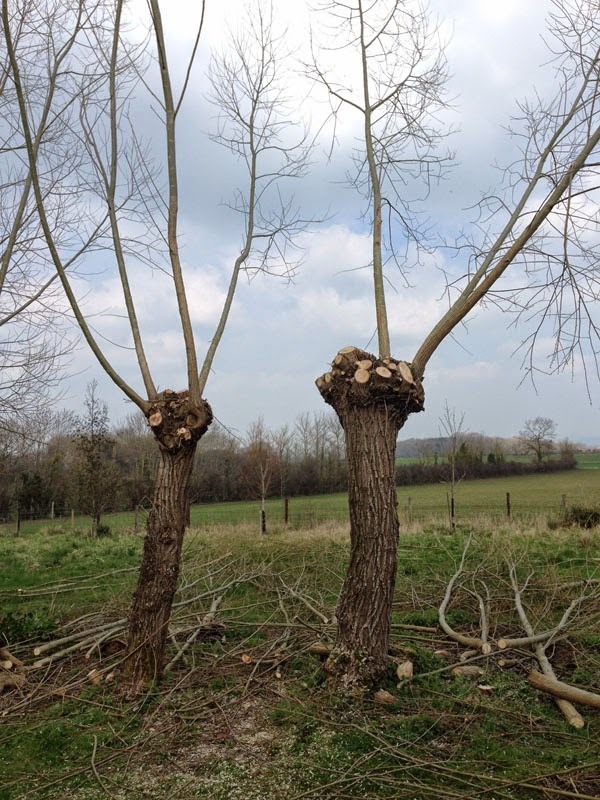 Gavin and I had previously sourced an ash tree thats limb had split and although still alive it balanced on the floor before elevating itself again. 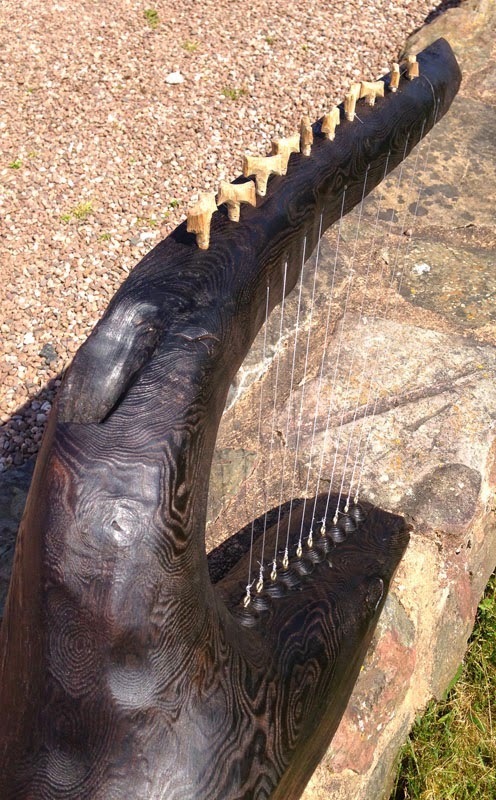 It had a number of good forks in it for the harps and the height meant people could work at a comfortable level. 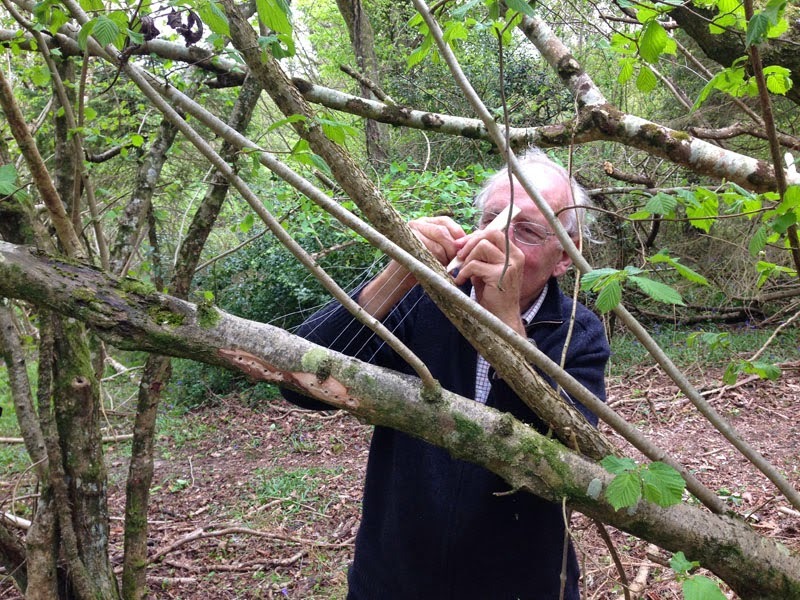 I took a number of my hand held tree harps to explain the methodology of the tree harp and of we all went knives, axes, bow saws and drills. 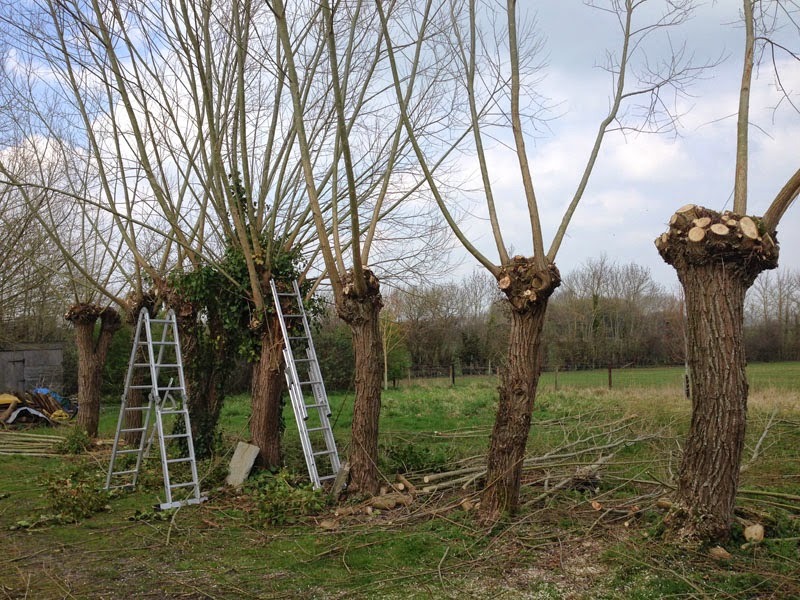 once everyone had decided which bit of the tree suited them they set about making turning pegs to hold and tighten the nylon. 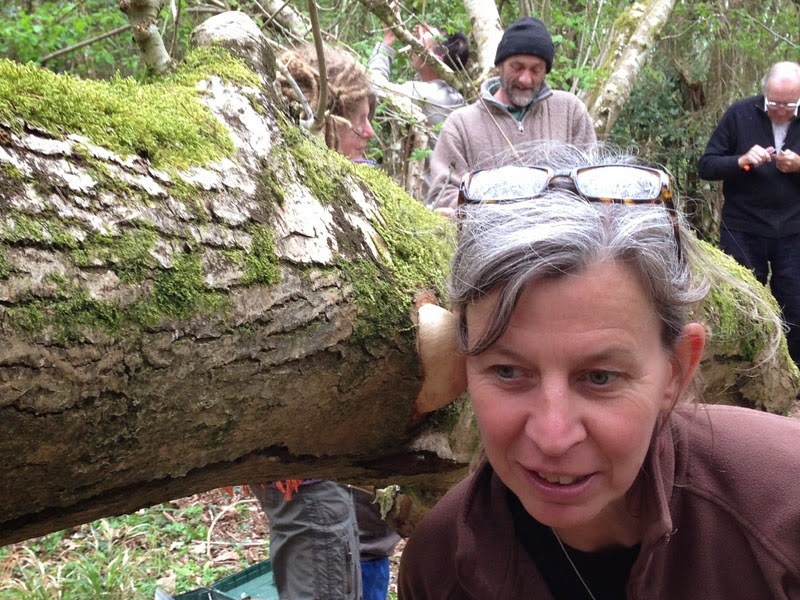 Only one injury and the day was a total pleasure, everyone really got into the spirit of it and the wonder of the sounds being heard in the tree. 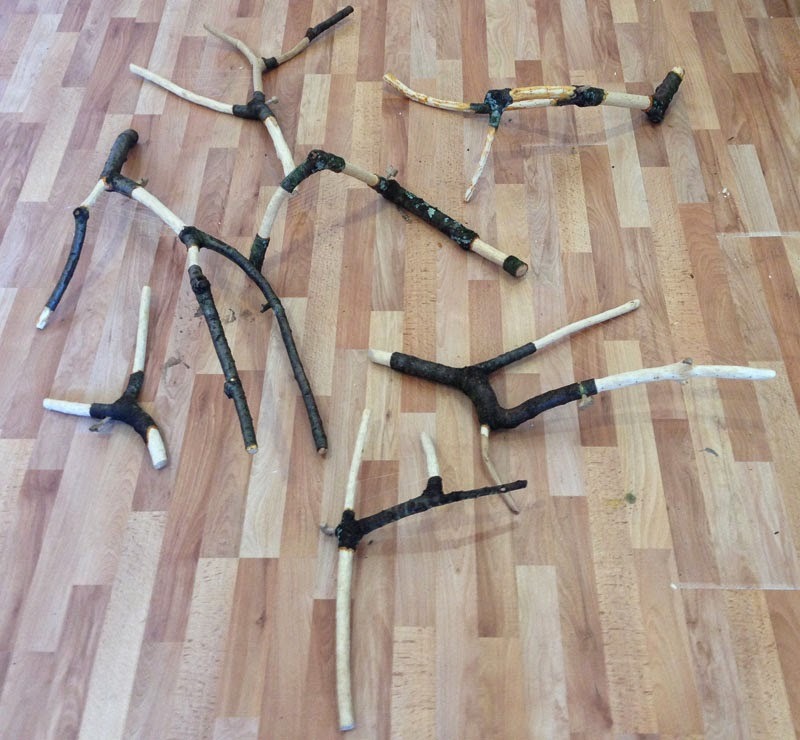 People came up with great ideas and we even had a tremolo arm created by one of the participants. Exotic Bridges for the strings, beautifully shaped listening points, exceptional group. 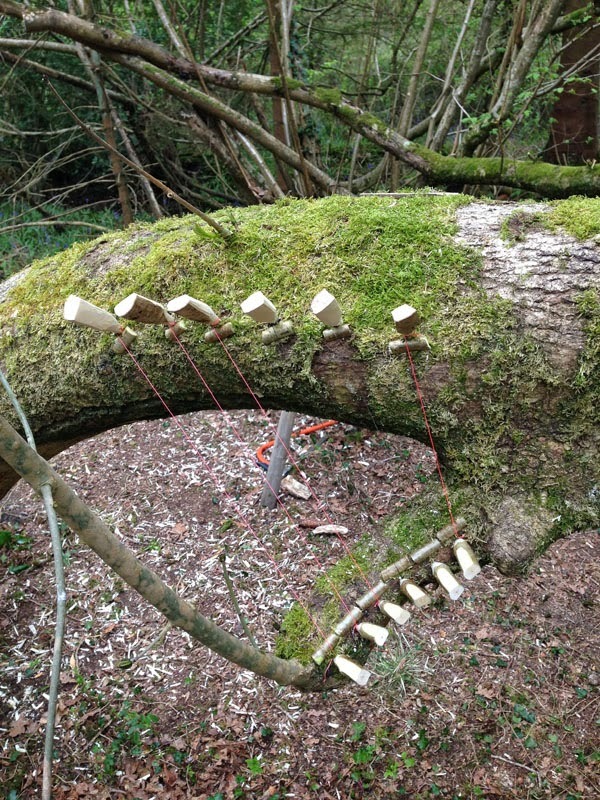 I have also been in my studio making this charred ash sound sculpture from the trunk and branch of an ash tree gathered in my wood. 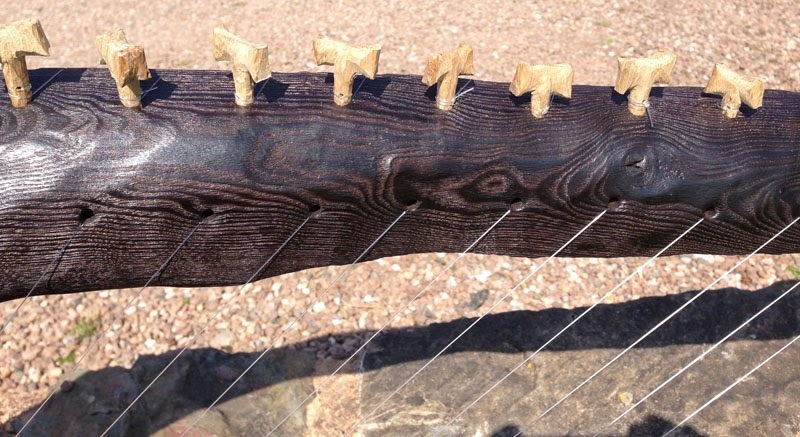 I have used brass eyelets for the first time to hold the nylon strings in place at the bottom whilst at the top I have fed the nylon through the section and made a number of tuning pegs so each string can be tuned to whatever note you should choose. 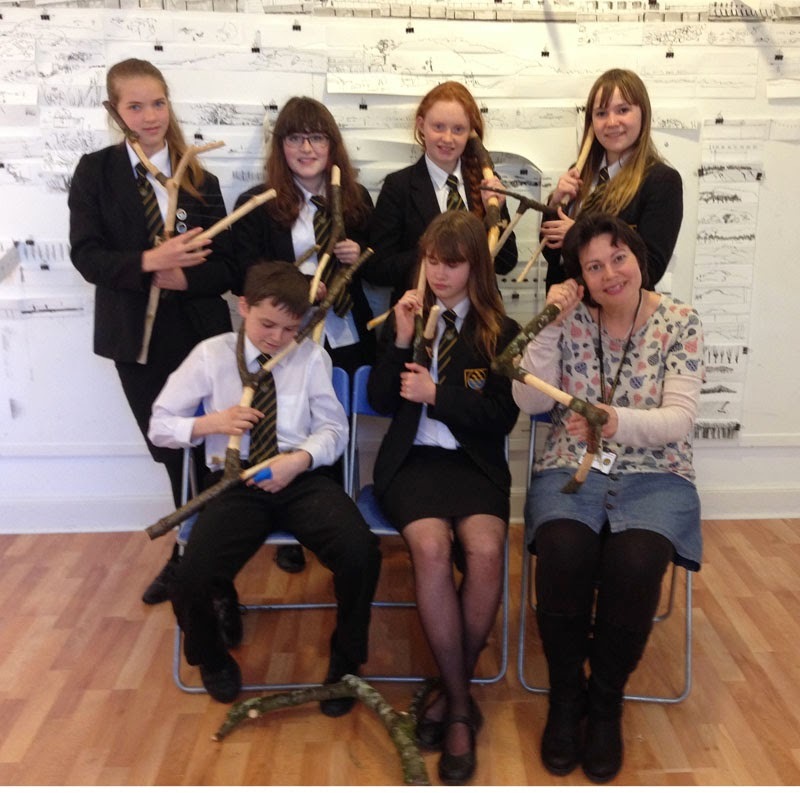 Yesterday saw six students and a member of staff from the Ax Valley Community College come to the Thelma Hulbert Gallery in Honiton for my ear harp workshops. 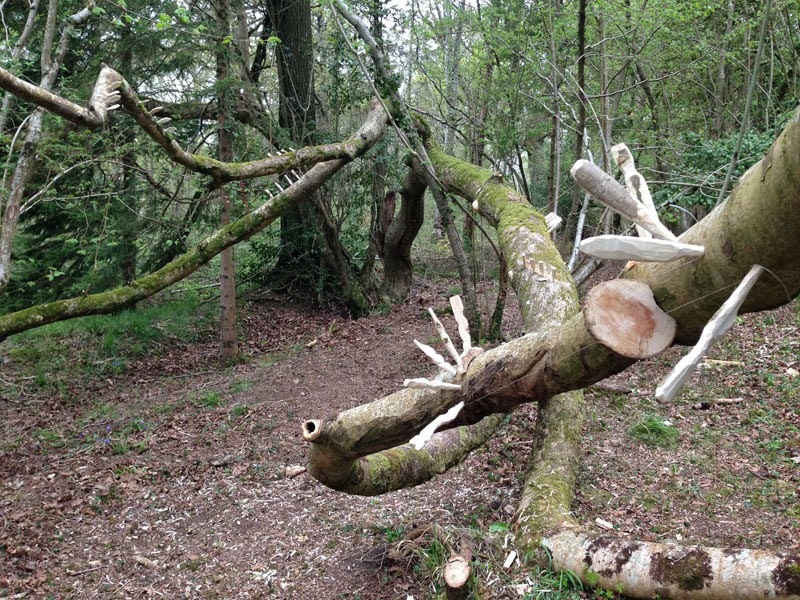 I had previously cut some cherry from my woodland in somerset (a recently fallen branch) into shapes that could be used to create ear harps (see previous entries for details). 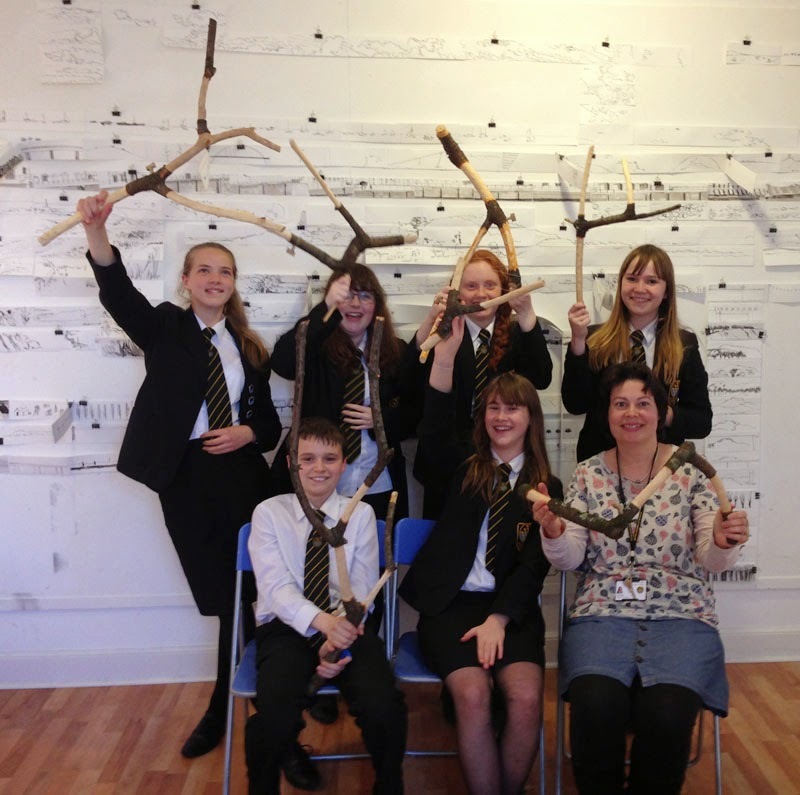 The students came to the gallery and were greeted by Angela who introduced the gallery and the exhibition, they then played the walls and had a thoroughly good play. 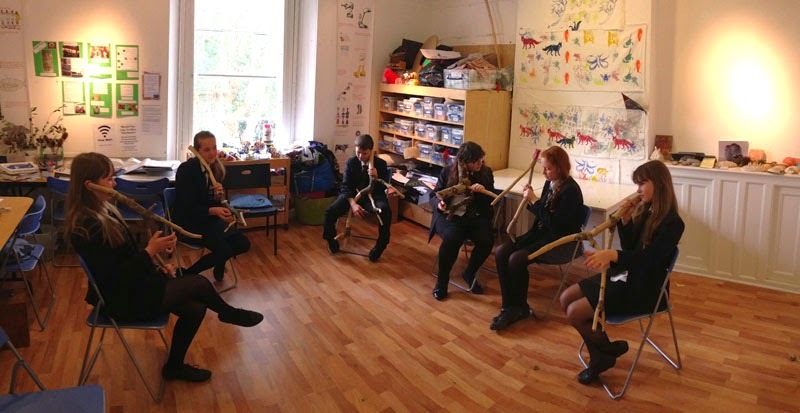 We then moved upstairs to the educational room and embarked on the creation of their own ear harps, after an introduction to my instruments and their playing of them they chose their own shape and piece of wood, democratically and without to much controversy! A brief introduction as to the safety of using knives and whittling and off they went, They were very good, we did have have one slice of misfortune when the only boy in the group decided to cut his finger, plaster administered and all was fine, although a couple of biscuits did also help! Back in the afternoon to finish off and string the instruments. 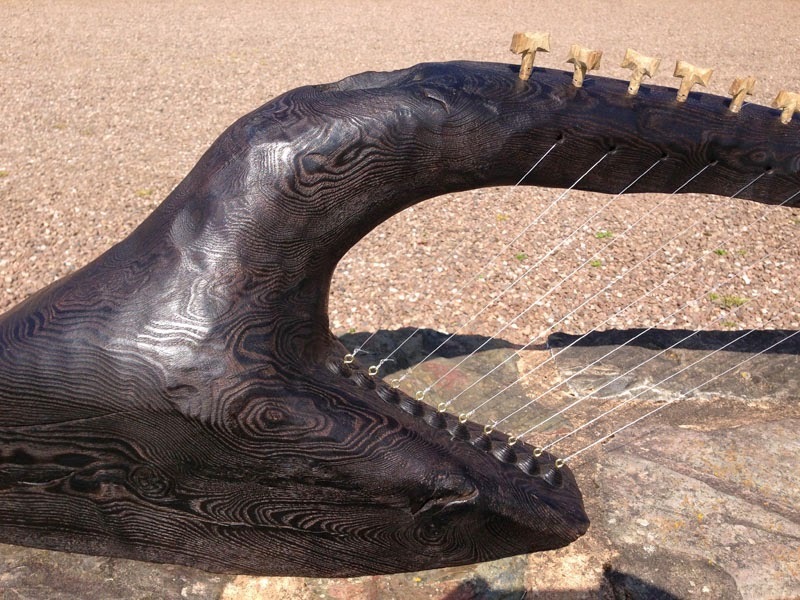 they did a fantastic job, creating not only great designs but wonderfully sounding instruments. 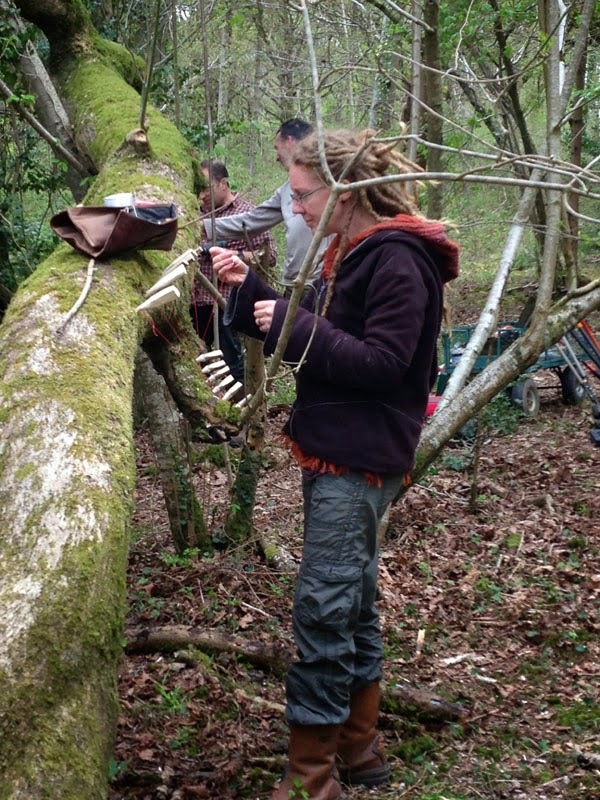 The idea that in a few hours you can make your own unique instrument was greatly appreciated. This Saturday the 18th of April I will be in the gallery from 11.00 - 2.00 to talk about the show and also help you if you need help to record your sounds, so please do come along. 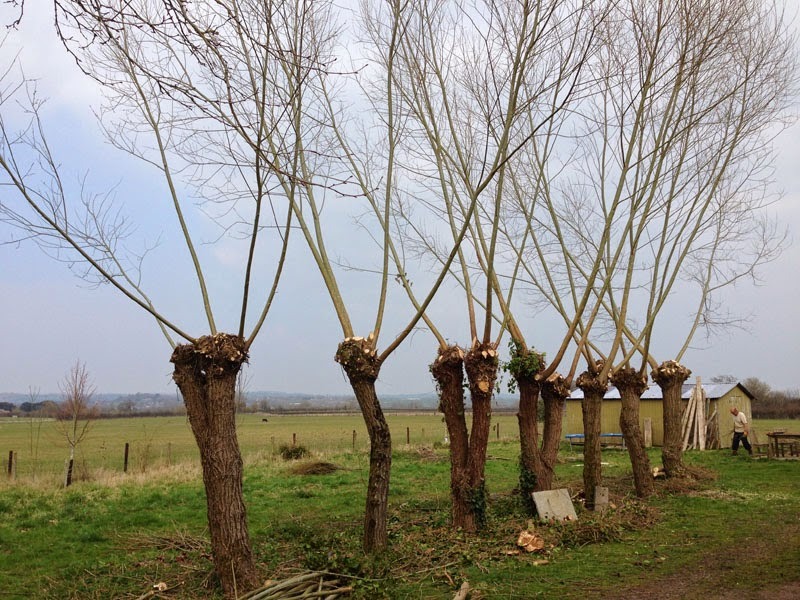 There is a project afoot at Dove Studios with Bron Bradshaw, a project using pollarded crack willow. 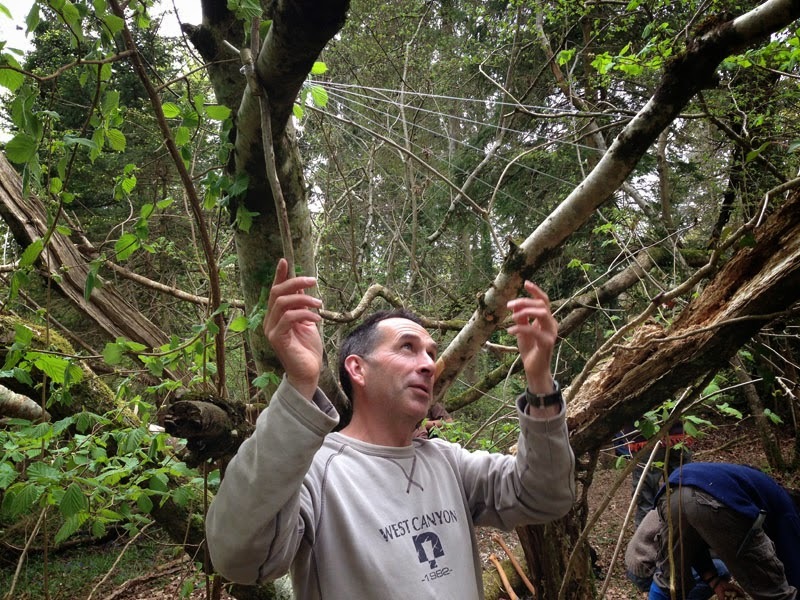 I have been brought in to create some sound instruments out of or with the crack willow. 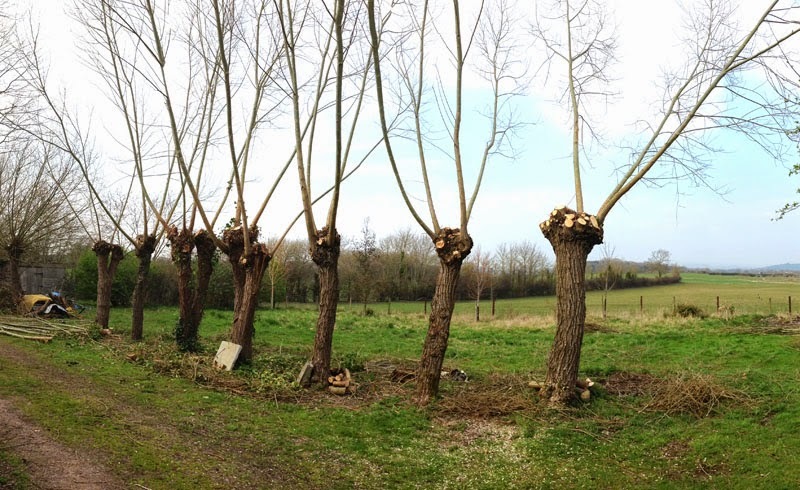 A plan is gestating to create something as yet unknown with the live trees, so I pollarded with the magnificent help of Laurie, leaving some branches to grow and possibly become supports to whatever I might make, these may be cut down yet in July (next phase) or left, the offcuts might become hanging beating elements ala a xylophone or the living pieces elements of an aeolian harp. so watch this pace and see what could happen.